Please refer to our stock # 0907 when inquiring. 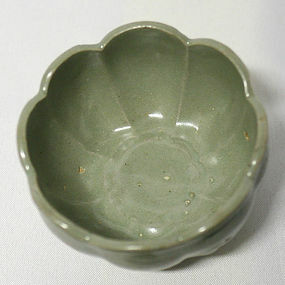 Delicately Incised 13th Century Lotus Form Celadon Cup. The lotus is a symbol of purity and rebirth. The quality of purity is beautifully captured in the soft sincerity of the delicately incised lotus blossoms on each petal and the outer rim floral scroll of this fine cup. 3w x 2h inches, 7.5w x 5h cm.